Foliated conglomerate clasts do not much resemble the Paleozoic metamorphic rocks, but instead resemble the footwall phyllites. In 2005, mapping in the Upper Gallagher area suggested that the conglomerate clasts were derived from footwall phyllites and that the phyllites were foliated versions of mafic volcanics and intrusives that had been dated as late Triassic. Something is very wrong with the old model. It's logic demands that the ore contact be located on a Triassic-Paleozoic unconformity. This is inconsistent with radiometric dating, it is inconsistent with expected VMS deposit morphology, and it doesn't reflect the widely varying morphology and lithology of the conglomerates. A penecontemporaneous origin for S1 would solve these problems, in essence, making S1 and S2 the same foliation caused by the same event. More understanding of the formation of the conglomerate is necessary to complete this picture, but that will be for later. 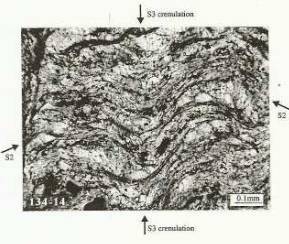 Diagenetic foliation enhanced by a shear stress during diagenesis and induration. Early bedding plane foliations are quite common throughout the world. Historically these were attributed to regional scale isoclinal folding even though evidence for the folds was often absent or ambiguous. The prevalence of the fabric and the unlikelihood of the vertical stress regime postulated to create bedding plane fabric has caused some to rethink the origin of these foliations. More recent work, such as that of Passchier and Trouw, has attributed such fabrics to diagenesis. At least in part the change in thought has come with the recognition that foliation may be created or enhanced by pressure solution-a process that is not dependent on high pressure and temperature to operate. Progressive deformation from diagenetic event. Increased lithification results in different fabric. The occurrence of spaced cleavage and crenulation at high angles to bedding plane foliation is a common occurrence world-wide-perhaps too common. Again, the recognition of crenulation and spaced cleavage as being a product of pressure solution (not necessarily a high P-T process) has opened the possibility of new interpretations. Pressure solution formation of a bedding plane cleavage in a diagenetic environment has some distinct implications for formation of secondary fabrics such as S3. Because pressure solution can result in significant volume loss, and that volume loss is plainly evident at Greens Creek, one would expect a progressive deformation. I.e., as the rocks lose volume, they move and deform to accommodate that loss. The nature of the secondary deformation will be different from the first for a couple of reasons. First, the change in the rock brought about by pressure solution bedding plane foliation will change the rock. And, second, progressive lithification of the rock will change the nature of the deformation. Folds and inhomogeneous folds in the ore zone approach isoclinal. Larger F2, such as the LSW-200S fold are open. Ore zone folds that appear isoclinal or inhomogeneous are soft sediment deformation. The larger fold is part of the same sequence of progressive collapse. The established folding scheme at Greens Creek is not understandable to me-and I expect that it is not really understandable to anyone else either. It has been a matter of debate among structural consultants as well as others. That doesn't mean that a fold can't be traced from one place to another. Some of them can and that can be useful. In fact, the most prominent feature of the deposit when looking at Datamine views is a very large open fold with approximate right angle limbs that runs from the Northwest ore bodies through the Lower Southwest ore body to the 200S ore body. This fold appears to me to be an F3 fold in the established scheme, but it has been called an F2 by some. 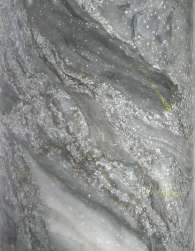 Tight folds labeled F2 occur in the ore zone and in the argillite beds immediately overlying the ore. Attempts to trace these over long distances have mostly failed and "inhomogeneity" has been offered as an "explanation." (But of course that isn't an explanation at all. ) The increased intensity of the folding in the ore zone has more or less been ignored. There has been some discussion of the effects of the orebodies in localizing structure-variously they are described as competent rocks that affect the locations of folds, or incompetent rocks that flow into the noses of folds. Shearing, healed shears, duplexing, and other disconformities associated with all stages of folding have been either ignored or glossed over. Despite this, they are among the most prominent structural features ones sees in the ore zones. They don't fit the established scheme. The new model presents a different way of looking at the folding which has the power to explain and simplify all of the features without the logical conflicts and contradictions. When one views the tight folds in the ore zone as soft sediment features related to progressive deformation accompanying seafloor collapse, all of the features fall into place. The stratigraphic control of deformation makes sense, the coincidence of folding and orebodies makes sense-they are both related to the deep structure forming the collapse. Disconformities are explained. Traceability is much more understandable. Open folds in the footwall resulting from second phase of Cretaceous tectonism. Much of the discussion of F3 folds is linked to the above discussion of F2 folds. As noted above, there are some serious problems distinguishing between the two. In all likelihood, an F3 fold is one that has been folded or appears to fold the S2 foliation. Again, progressive deformation is a much simpler explanation. The work I have seen defining F4 folds shows that these are separated from F3 folds by disconformities. In all probability, these are just earlier folds rotated in a progressive deformation. They are coaxial and look very much the same as folds described as F3. The standard model has become so complicated that it now seems all but impossible. The model's four phases are recognized as being inadequate, so more phases have been added. I am not sure what we are up to now, but it is at least six or more. This is all in rocks that as one can see from the picture of pillow basalt at Gambier Bay have no particular regional deformation at all. The Occam's Razor for this problem is one progressive deformation from a localized seafloor collapse. Suddenly the problem is simple. 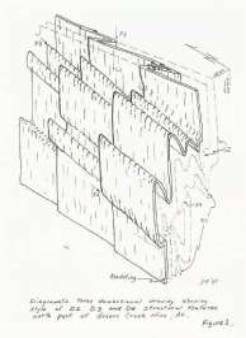 Unfoliated areas that have sharp crosscutting relationship with foliated rocks. No formal explanation given in any reports. Has been logged as "carbonate alteration." When one looks at Greens Creek core day after day, one sees some very strange stuff. One of the things I saw were areas where the phyllitic fabric disappeared. Completely unfoliated rock cross-cut the foliation--it was as if concrete had been poured into cracks in the rock. There are other non-conforming and apparently unmetamorphosed rocks in and near the ore zones too. I saw a cross cutting sulfide carbonate breccia in the 200S zone. To some extent-and in some places, the conglomerates themselves have these characteristics. The easy explanation is that they are clastic dikes. But the reality is that they have been ignored because they do not fit the standard model. 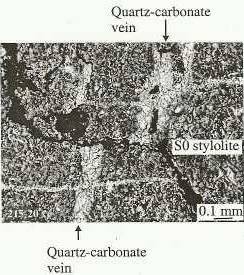 Soft sediment deformation has moved sulfide off of carbonate ores. The PhD student, Katja Freitag, did a structural analysis of the Lower Southwest orebody and concluded that it consisted of two mounds of ore-one sulfide and one carbonate. Her conjecture on the reason for this was that there were two vents operating at two different times to build the two mounds. The reasoning was that one vent became plugged and the other active. A simpler explanation is that movement after deposition separated the carbonate and sulfide masses. They would have been very different consistencies in the time shortly after deposition. The absence of any feeders is best explained by pressure solution in the footwall. And the out of place bits of sulfide are remnants of the larger moved mass. Apparent different degrees of deformation in sulfides than surrounding rock. 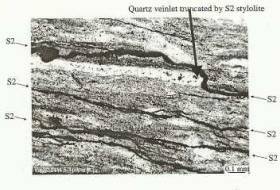 Sulfides are less susceptible to high P-T metamorphism than surrounding rock. Surrounding rocks are deformed by pressure solution processes and sulfides are less soluble. There is little question that the rocks have been subject to an intense pressure solution deformation. The microscopic textures seem indicative. Understanding of low grade metamorphism of sulfide minerals is in a sorry state to say the least. From what I can tell, deformation of sulfide beds is considered to be evidence of metamorphic deformation, just because. Other sorts of deformation don't fit the models. On a macroscopic level, Greens Creek ores appear to have flowed in places. In some areas, things that look like bedding in the ores look like flow banding when one steps back. Sulfides flow more easily in metamorphic situations than surrounding rock. Fold hinges represent conduits for fluids and centers of mounds. Slumping and soft sediment deformation have moved sulfides to hinge locations, partly by duplexing. 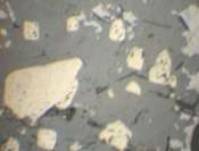 Sulfide minerals are among the most brittle of minerals at lower temperatures. They are also extremely resistant to pressure solution, an important observed process at Greens Creek. In polished section, Greens Creek MFB shows textures that are most easily explained by movement of sulfide muds. Pyrite crystals have rounded corners and some are even round in shape. Some crystals that appear as squares with rounded corners have centers that appear to be ghosts of framboids. Where sulfides constitute a smaller proportion of the rock or in inclusions in the massive sulfides, pyrite takes the form of unrecrystallized framboids. 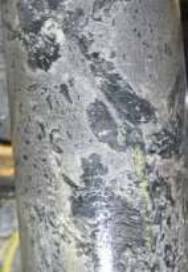 The simplest way to explain the form and texture of the ore is deformation of semi-lithified sulfide muds. I think they are attributed to D2 extension prior to D2 contraction. 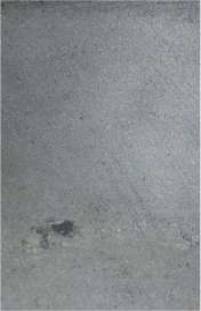 Freitag attributed them to diagenesis based on petrographic study. One report described the ladder veins as the result of a 100 percent extension of the rock as the first part of a progressive, presumably Cretaceous, deformation that eventually had a several hundred percent contraction. On the other hand, Freitag attributed them to diagenesis. This is quite a variety of opinions. Some better study is needed for something that is such an important guide to ore. Ladder veins have been observed in progressive penecontemporaneous deformation elsewhere and that seems to be the easiest explanation here.